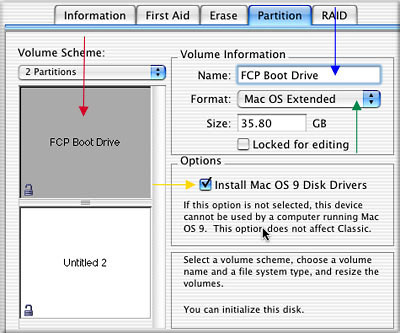 Instructions for partitioning either a boot drive or non-boot drive. With the imminent release of Final Cut Pro 4, with its attendant 16 gig install, many of us have found that our boot partition is no longer big enough. Now is a good time to get your boot drive ready for FCP 4--or it could be that you simply want to partition a second non-boot drive. Partitioning a Mac OS X (Jag) Boot drive. 1. 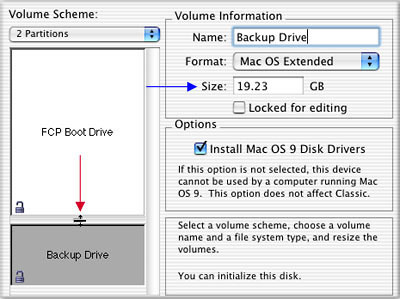 Insert your Mac OS X installer CD into the drive. Restart your Mac while holding down the 'c' key on your keyboard to boot from the installer CD. 2. When the OS CD installer dialog box launches double click on the 'Install Mac OS X' icon. At this point you do not want to install so do not click on 'continue'. 3. From the menu bar at the top of the screen click on Installer, slide down to Disk Utility. This will open the Disk Utility program. 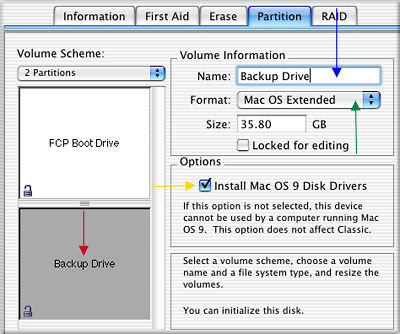 Click on the Partition tab and select the drive that you want to partition. 4. 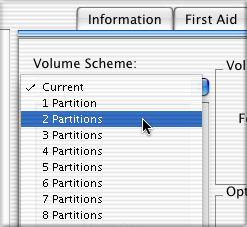 In the 'Volume Scheme' drop down, select the number of partitions you want to have. 5. For this example I have selected 2 partitions. I also have the "Install Mac OS 9 Disk Drivers" box checked. These drivers should be installed for machines that can boot into OS 9. If OS 9 drivers aren't present on the drive, you can't mount that drive from a machine running OS 9. If you want to boot into OS9 from this drive, or access it while booted into OS 9 from another drive/partition, its imperative that you install OS 9 drivers when you initialize or partition. Even for systems that don't boot into OS 9 it is a good idea; its possible to mount such a drive via Firewire T mode from another machine, which can come in handy in rare maintenance situations. It doesn't hurt to have those drivers there, and it might actually help one day. 6. Click in the top partition box to select it (red arrow below). Then enter a name for this partition, blue arrow. 7. Next using the 'Format' drop down menu select "Mac OS Extended" (green arrow below). In the Options Box check the 'Install Mac OS 9 Disk Drivers', yellow arrow. 8. Now repeat this process for all additional partitions. 9. Now that you have named your partitions it's time to size them. Place your cursor in between the two partitions, it will turn into a up/down arrow. Click and drag up or down to change the size of the partition, (red arrow below). As you drag, the new size of the partition will be reflected in the 'Size' box, (blue arrow below). 10. 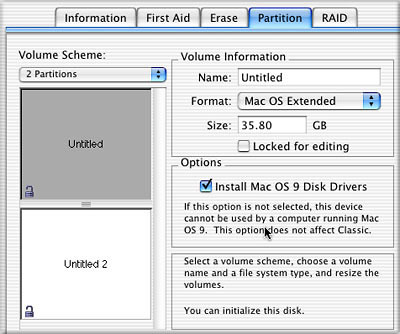 Once you have named, sized, selected 'Mac OS Extended' Format and 'Install Mac OS 9 Disk Drivers' for all partitions, click on the Partition button. Your drive will be partitioned. This process will only take a few seconds. Be aware that when you partition a drive all information on that drive will be lost, so be sure to back up any data that you wish to preserve. Once the partitioning process has been completed return to the Mac OS Install dialog box and click continue. Select the partition that you want to install the system on and continue. Partitioning a Mac OS X (Jag) non-boot drive. Partitioning a non-boot drive is a bit simpler. You do not need to start up from the Mac OS X installer CD. Simply open your Hard drive > Applications > Utilities > Disk Utility. 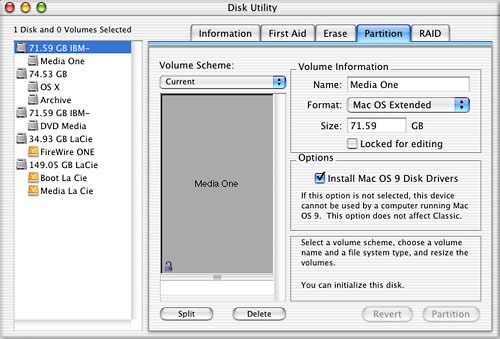 With the Disk Utility program open select the Partition tab, select the drive and start with step 4 (above). A Word of Caution. Mac OS X has UNIX at its core. There is one keyboard item that is reserved for Unix exclusively. It is the forward slash, "/". Never use the forward slash in the name of a drive or partition, file, folder, bin, project, sequence or anywhere else for that matter. "With the leap to OSX, many have been left in complete confusion about how to keep their Mac OS in shape. No Desktop rebuilding? No inits to troubleshoot? Of course, we all KNOW better than to believe that we should no longer worry about periodic maintenance. Mac OSX Jaguar doesn't look or act like the so-called "old world" Mac OS's, OS 9. It is built on a UNIX system that administrates itself. That UNIX core gives it the ability to repair and maintain itself to a limited degree.